Friday, June 12, 2015: You may have surmised by this issues quote that we expect to be home at the conclusion of this journal…..time will tell!?!? Pulled stakes and headed out from Lebanon Hills Regional Park in Apple Valley, Minnesota. However, before leaving we took one last look at the turtle nest and were pleased to see that everything was intact. It occurred to me that the turtle is a great metaphor for our way of life on the road…..we both plod along at our own rate and carry our shelter with us wherever we go. Maybe we should have called our annual treks the Bill and Kit Turtle Expedition! 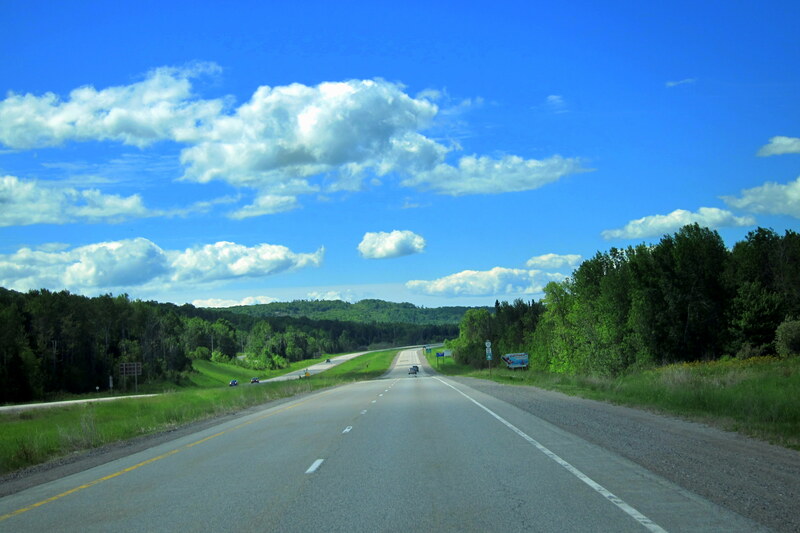 It is mid-morning, the sky is bright blue and the temperatures are rising…..it appears to be another great day to be on the road. However, very soon we were thrust back into the chaos and confusion of big city traffic as we skirt the west side of the twin cities and make our way toward the Minnesota town of Maple Grove, just 36 miles to the north. Why move the rig for only 36 miles, and why north? 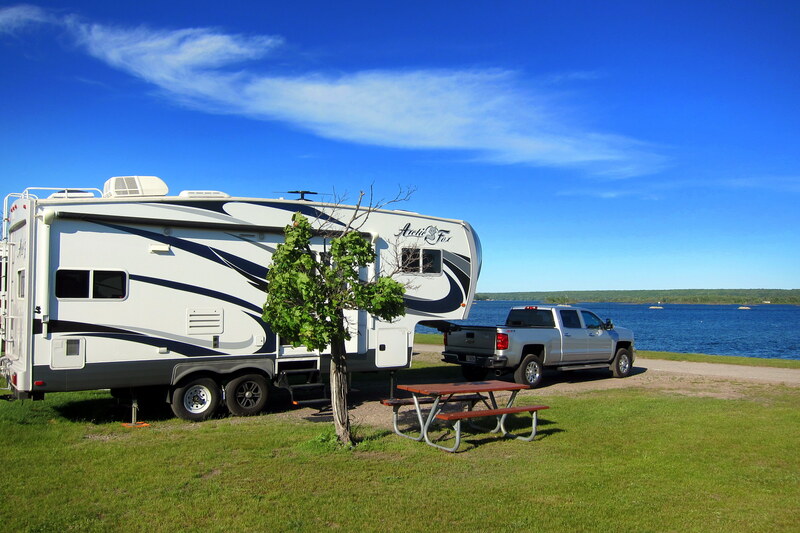 Well, as we have come to expect as the camping season ramps up, the nicer campgrounds are booked solid for Fridays and Saturdays. So since we had to pull out anyway, and since Kit still had some relatives to visit, we relocated to another local campground closer to them. This place is part of the KOA chain and the very same campground we stayed at in 2008, during the Bill and Kit’s GOFETCHIT Trip. 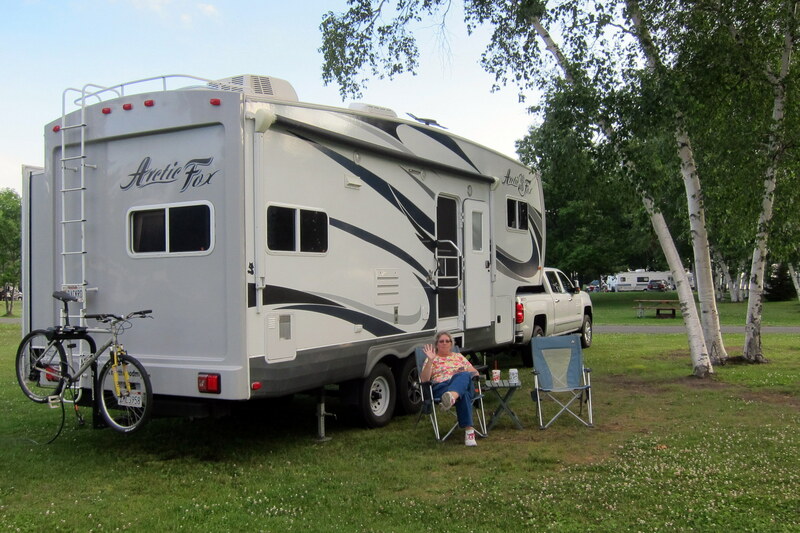 Since our original Arctic Fox trailer was purchased from a dealer a few miles away we utilized this park to spend a few days checking out all the systems before dragging the camper back to Maine. 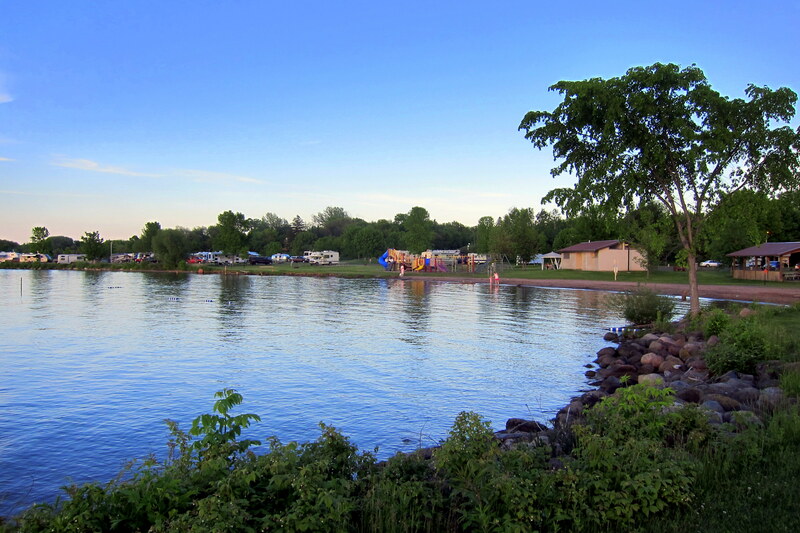 To our delight, the owners of Northwest Minneapolis KOA as well as the facilities are as nice and as accommodating as ever! Our neighbors were very nice as well! A three generation family down from Perham, Minnesota for a weekend graduation, they were a delight to have next door. Greg works for a food service company and kindly hooked us up with some freebies….an industrial sized bag of Kettle Chips! Thanks Greg, but you shouldn’t have. No, I really mean it, you really shouldn’t have…..because we devoured that entire bag in a scant two days…..yikes! 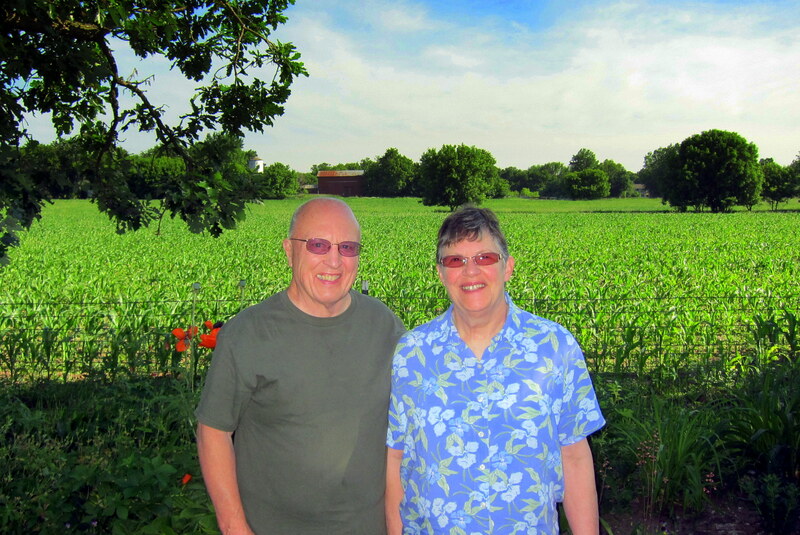 In the afternoon, we paid a visit to Kit’s cousin Billy and his wife Sharon who reside nearby in Blaine, Minnesota. 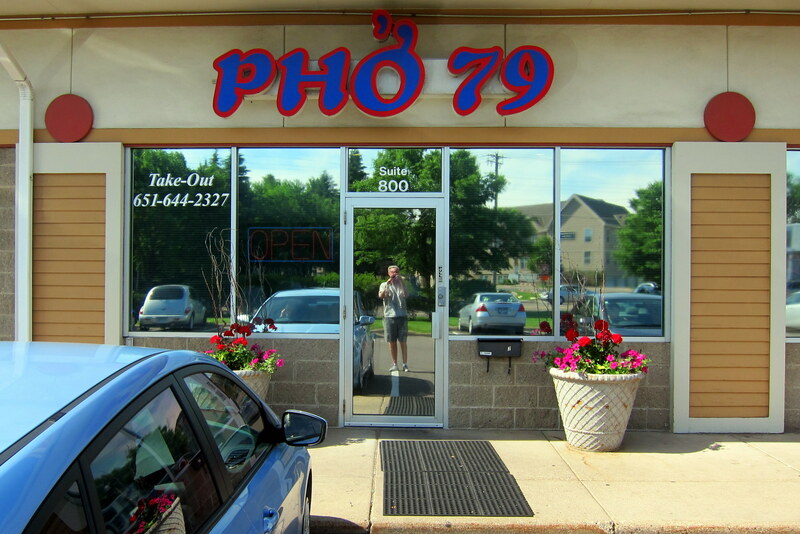 After a few hours of getting reacquainted, we drove into town for an early dinner at one of their favorite restaurants, Pho 79. Notice the fella inside through the front door…..kinda looks like me, however he appears to be a lot shorter and a whole lot older! After a tasty but somewhat eclectic meal of Vietnamese food, we returned to their home for more visiting. Upon saying our goodbyes, Sharon presented us with a loaf of zucchini bread which we devoured most of that evening before turning in for the night, Thanks folks for a great visit! 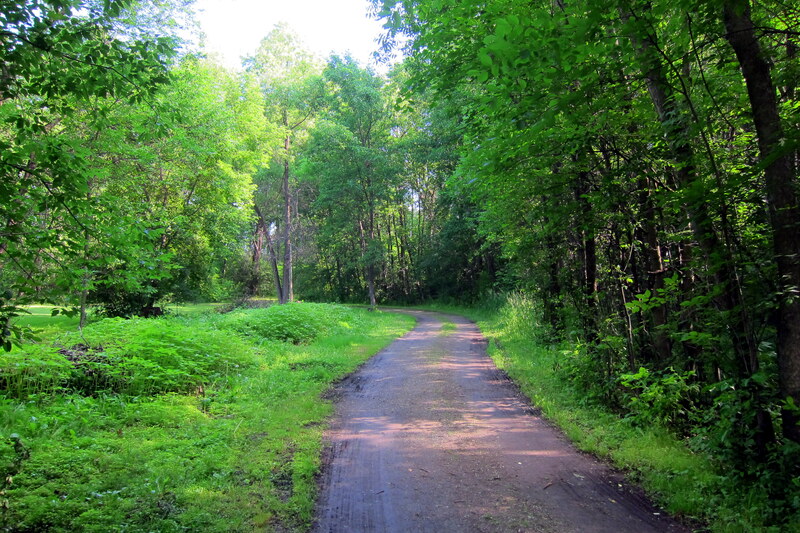 Saturday, June 13, 2015-Maple Grove, Minnesota: This morning we relaxed about camp and enjoyed a few strolls in the nearby woods. 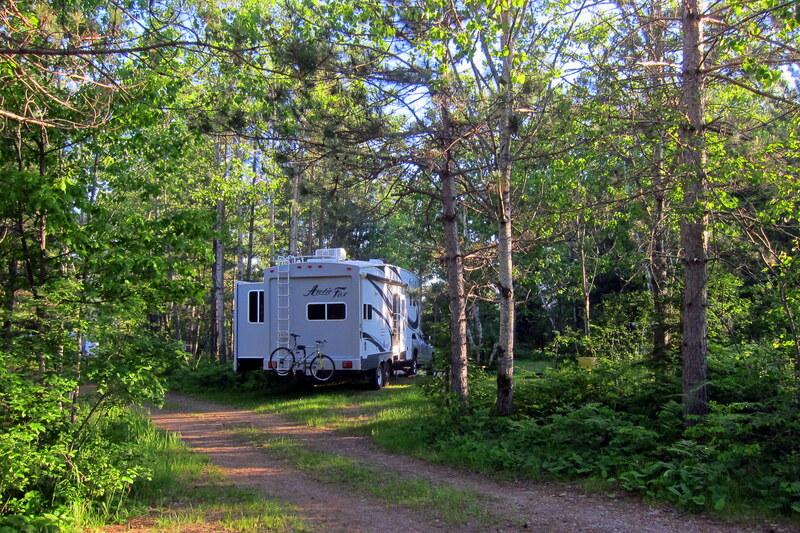 The owners have done a great job in laying out this campground. We are in the full hook-up section, which by necessity has fairly tightly spaced sites. However their dry camping area is spread about their wooded acreage and features lots of privacy. Being totally self-contained, if Kit and I were to stay here again, we would opt for the more private wooded sites. 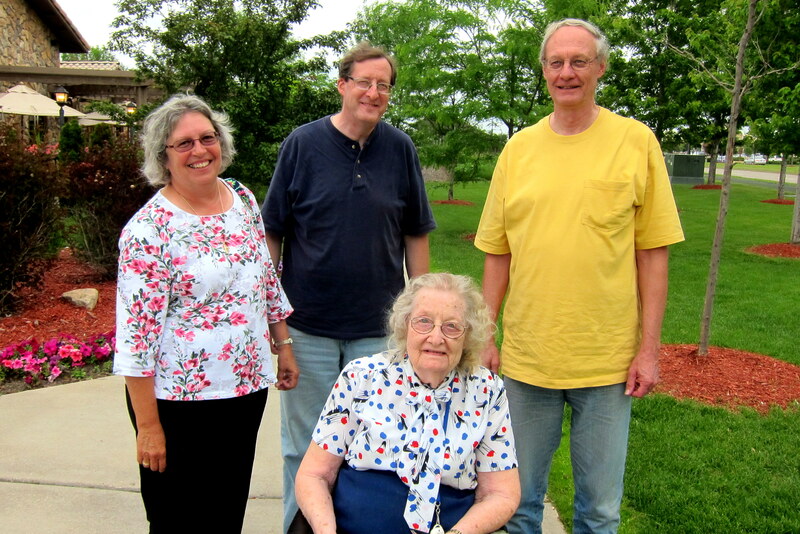 During the afternoon, we made our way south in order to visit Kit’s 94 year old aunt Vi who lives in a nice assisted living home in Brooklyn Park. Were pleased to find her two sons, Mark and David there as well. Following an enjoyable reunion we all reconvened at the local Olive Garden restaurant for an early dinner where David treated us to a great meal. After lingering over coffee for an hour or so, Kit and I took our leave and drove back to the campground for the evening. Thanks for the meal and company, Dave! Sunday, June 14, 2015: Following a leisurely breakfast and another walk around the campground, Kit and I got underway shortly before the noon hour and pointed our rig toward the east. Piecing together a number of state roads before settling on US-2, we crossed the Wisconsin border at 1510 and continued to roll easterly. Three hours later and getting weary Kit noticed a municipal campground in the little town of Ashland, Wisconsin which was right on the shore of Lake Superior. Being a Sunday, there were plenty of quality sites available at this late hour. We chose one of the more isolated ones a row back from the water that was long enough to allow us to keep truck and trailer connected. 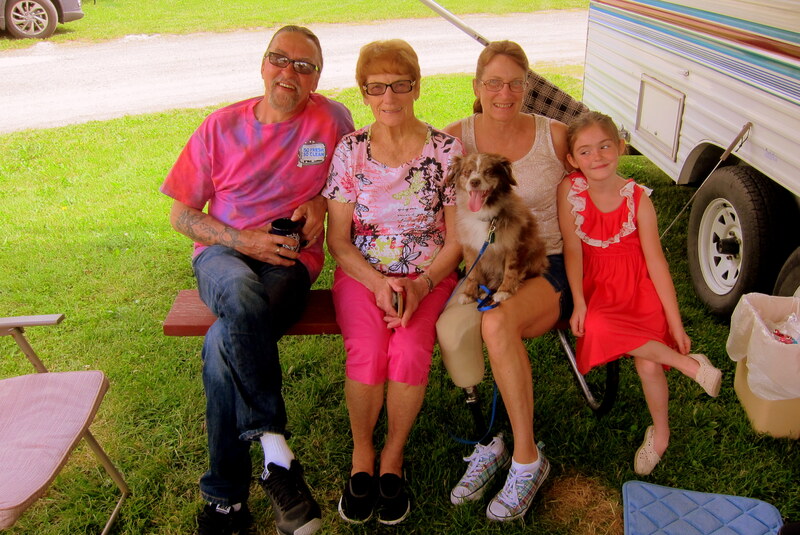 The sites were large and being a small town owned campground the price was great! After dinner, Kit and I walked the lakefront as the sun was setting in the west and the Sunday afternoon boaters were headed for the nearby town owned marina. 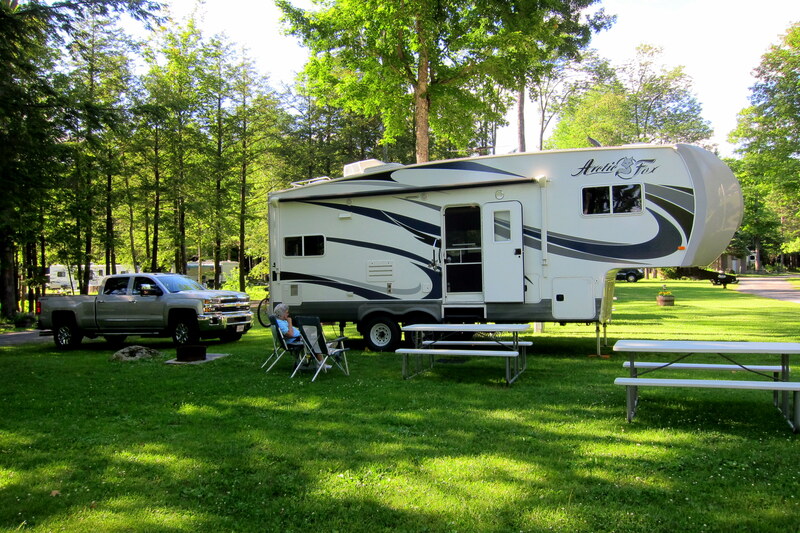 Another quality camping facility owned and managed by the host town…..there seem to be more and more of these popping up, much to the chagrin of the high dollar and cramped RV Resorts. 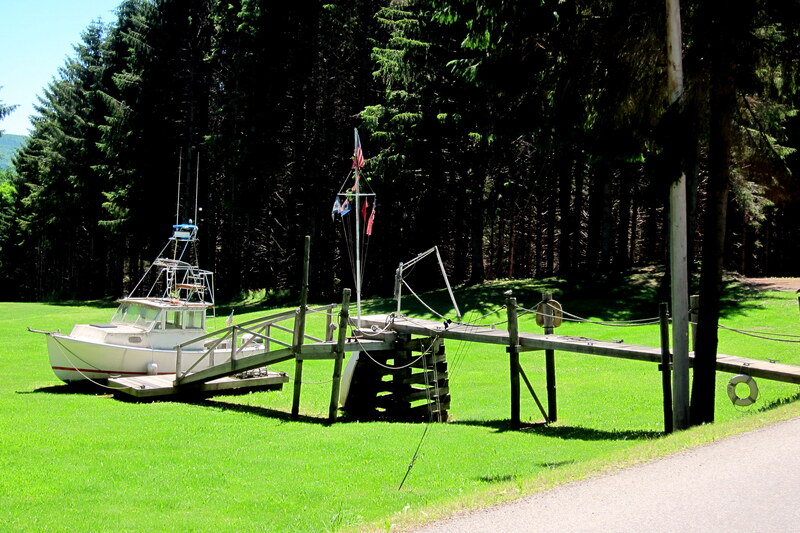 We certainly hope this marriage of town owned property and camping recreation will develop into a nationwide trend! 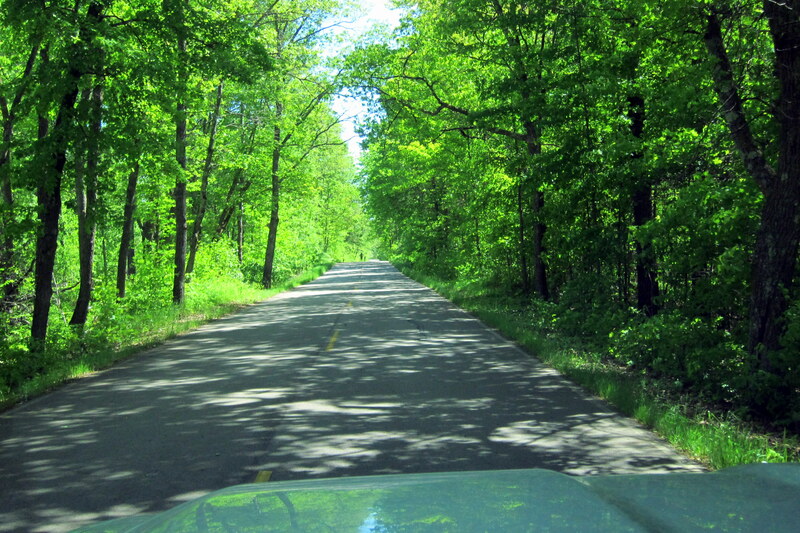 Monday, June 15, 2015: On the road at 1045 under sunny skies and a temperature of 75 degrees. Hopping back on US-2 heading east once again, we crossed into the state of Michigan within the hour. 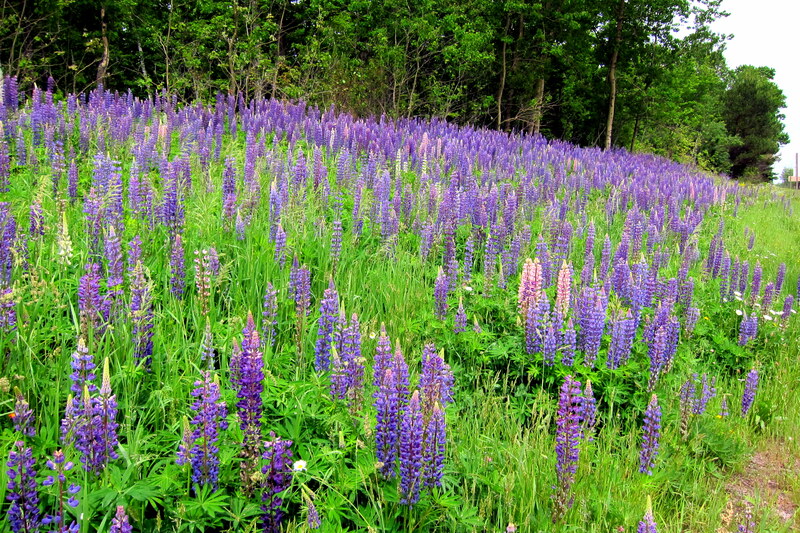 All along the roadside wildflowers were in bloom, and in one 20 mile swath there was a burst of colorful Lupines bordering the north edge of the highway and virtually none on the south side!?!? These colorful plants are actually members of the Legume Family and the seeds are edible…..generally superior to the more commercially grown Soybean. 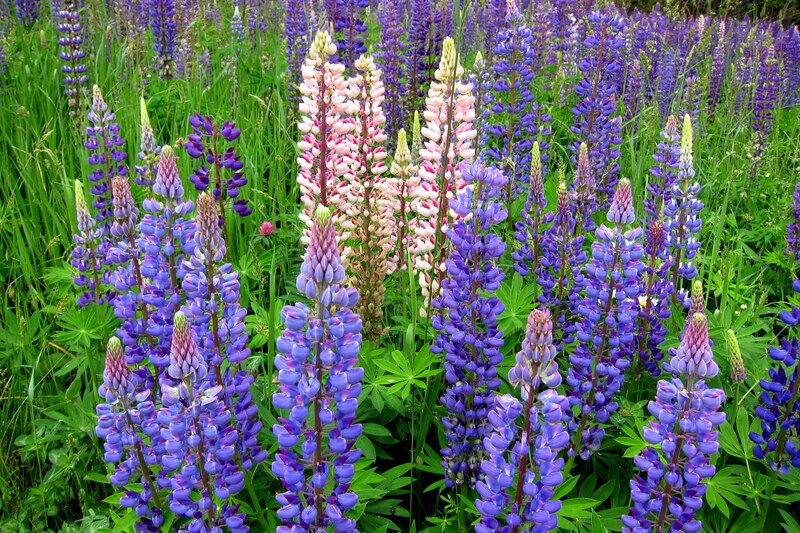 Also called Bluebonnets, The traditional blue Lupine can also exhibit a rainbow of other colors. After a roadside break and some lunch near the field of Lupines, Kit and I were soon rolling along once again. We often notice odd things as we bounce about the US, and today was no exception. Coming upon a rig that was traveling much slower than us, which is pretty dang slow, we eased out across the yellow dotted line and accelerated to pass. Coming alongside I noticed it was a pickup truck sporting a green canoe and towing a small stock trailer containing a Holstein cow. Kit and I entertained ourselves for the next hour by speculating what that was all about! 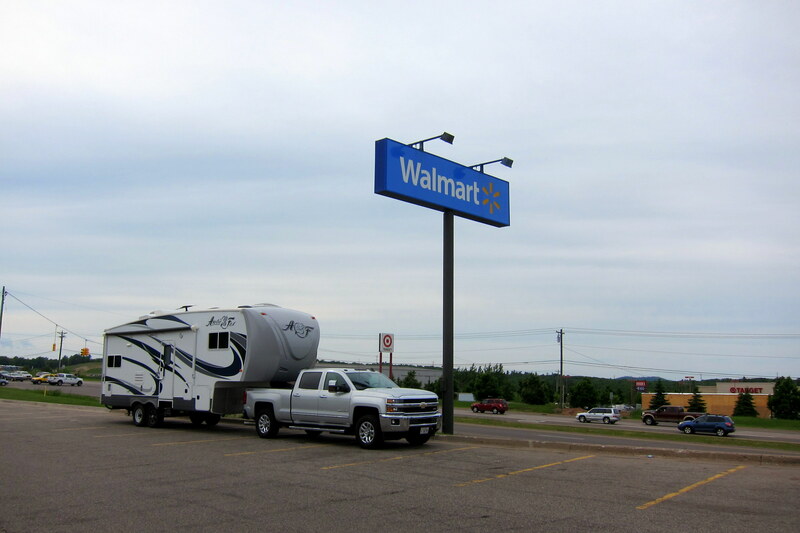 At 1220, we crossed the Central Time Zone and a few hours later pulled into a convenient Wal*mart parking lot in Marquette, Michigan. We needed to resupply, and I wanted to inquire about their overnight camping policy. Finding the customer service manager, she welcomed us to stay the night and mentioned that we would certainly have company as their store was open 24 hours, featured security patrols and was convenient to a major east/west highway. In addition, the McDonalds inside the store featured a robust public WiFi which we used that evening to catch up on e-mail correspondence before heading off to bed. Tuesday, June 16, 2015: Woke early as the sun streamed through the skylight above our bed. As often happens, it took a minute for me to remember where we were. Looking out the window I noticed the stark surroundings of a Wal*Mart parking lot and a few other traveling RV’rs scattered about. 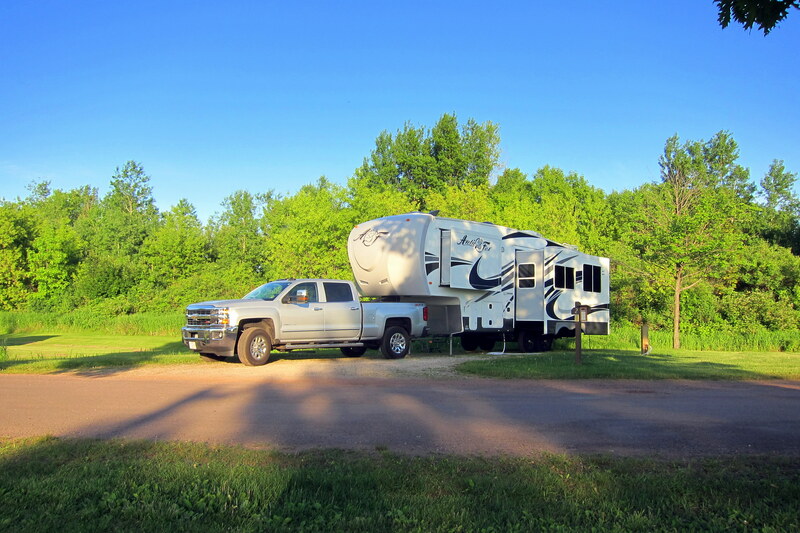 Camping in a parking lot, or in a truck stop, or at a highway rest area, isn’t the most scenic…..but the price is sure right! No need to pay thirty dollars for a quick overnight stay. I wonder why someone hasn’t thought to establish a chain of low cost overnight parking lots. These could be spaced a day’s drive away, have a system for self-pay and possibly feature an electrical connection…..sounds like a great business opportunity considering the growth of RV’ing and the trend toward municipalities restricting camping in commercial parking lots such as Wal*Mart’s. Anyone want to invest? As Kit continued to slumber, I decided to walk into the store and fetch a couple of breakfast sandwiches and two coffees. Near the entrance, I noticed a large display of Trenary Cinnamon Toast, so keeping with my tradition of sampling regional foods, I purchased a bag. 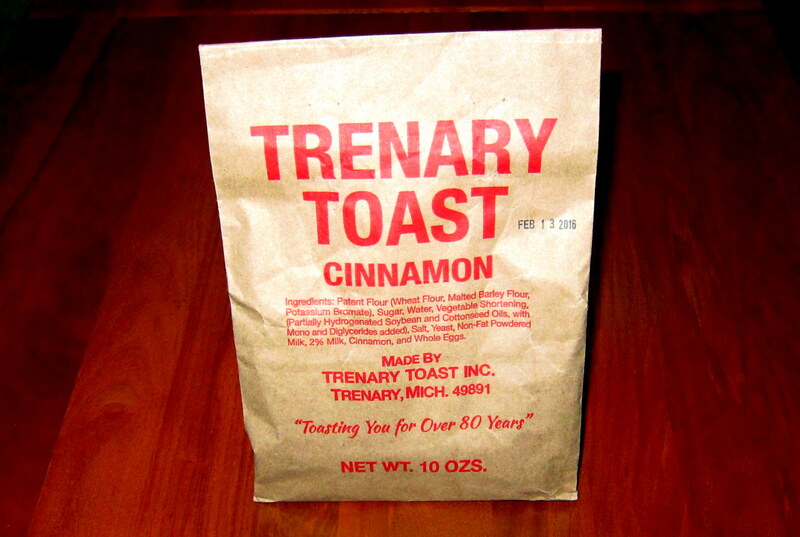 Trenary Toast, named for the area in the U.P. of Michigan it originated, is Finnish toast with a hard dry texture and infused with cinnamon sugar…..it was a bit hard but had a nice flavor. Apparently Ternary Toast is supposed to be dunked in one’s morning coffee but we just nuked it for a few seconds and it became softer and more flavorful, and it paired nicely with the McDonalds coffee! At 0934 Kit and I (yep, she’s awake) rolled out of the parking lot weaving our way around the several other RV’rs that had sought refuge for the evening. Easing back on US-2 we continued east as we discussed where to head next. Kit mentioned she would like a return visit to Sault Saint Marie, Michigan so that became today’s destination. Moving over to MI-28 we traveled east through the Upper Peninsula of Michigan and through the picturesque town of Munising before finding I-75. 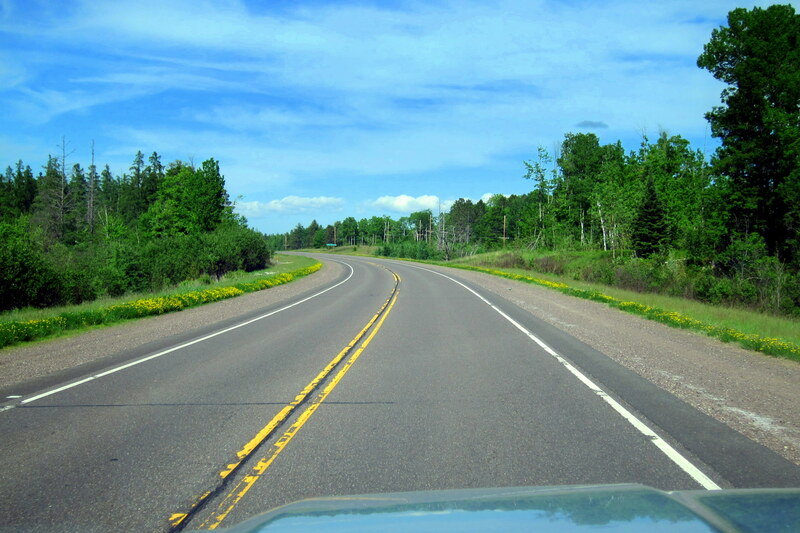 We jumped on the interstate heading north and in a few miles came to the exit for the town of Sault Saint Marie. Checking the All Stay’s App, Kit discovered yet another municipal campground where we headed and selected a nice riverside camp spot. Our best views are out the port side of the camper, so this spot proved great for watching the river activity while enjoying a meal! 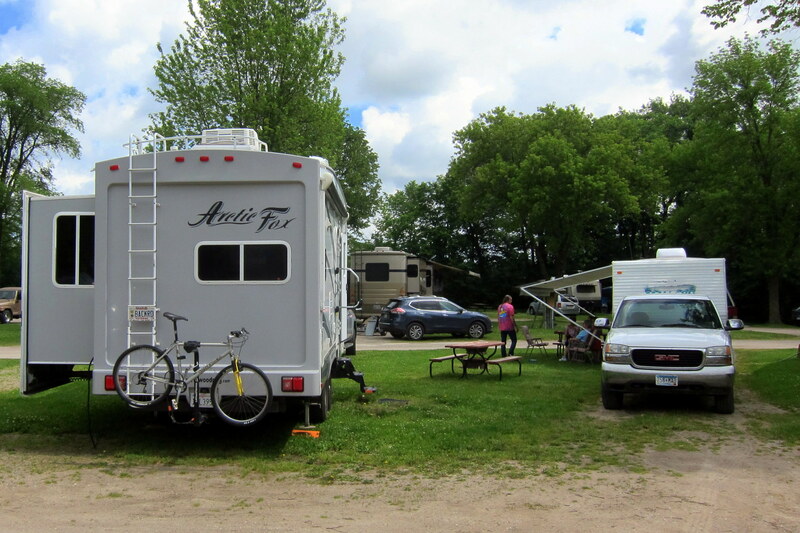 Aune-Osborne is a great town owned and managed campground on the famed Saint Mary’s River and a perfect headquarters for our multiday stay. After a nice meal and some visiting with our new neighbors, it was off to bed for us. Wednesday, June 17 and Thursday, June 18, 2015-Sault Saint Marie, Michigan: So what’s the attraction here? Well in addition to this being a nice little town of 14, 000 folks that also host the famed Soo Locks Complex, there are many of these leviathans steaming past! And all visible from your campsite! These things are so massive and powerful that they literally make the ground shake as the lumber by. Why so much freighter activity? 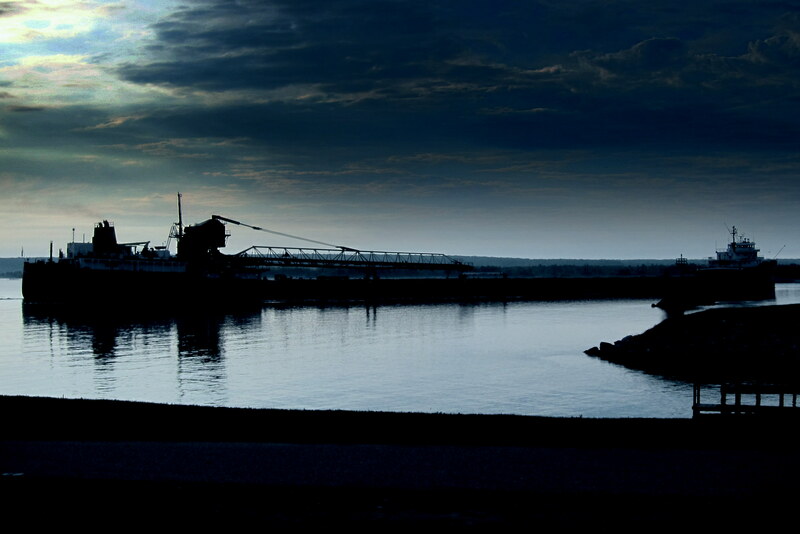 Well, the Saint Mary’s River drains Lake Superior into the lower in elevation Lake Huron by a system of locks. 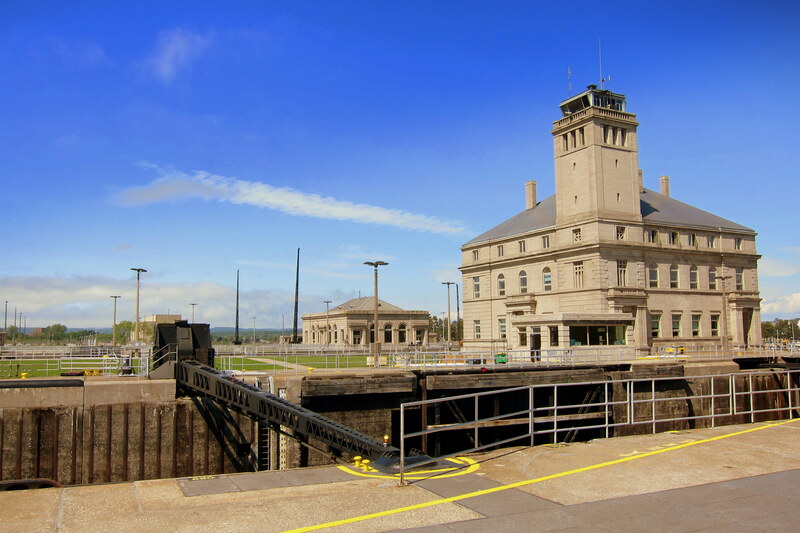 The Soo Locks allow passage of approximately 10,000 ships a year. And that’s only during part of the year as ice shuts down shipping for about three months! 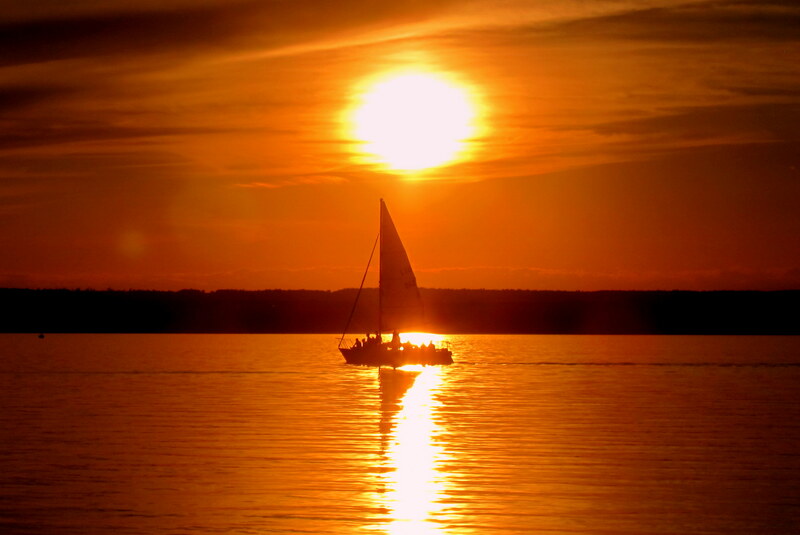 The US side is managed by the US Army Corps of Engineers and provides free transit to any and all watercraft. 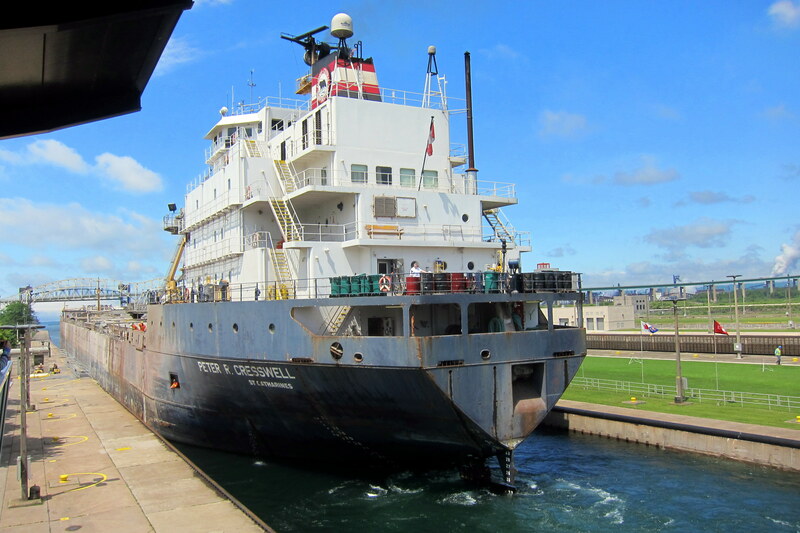 After exploring the visitor’s center, Kit and I headed to the observation deck where we watched a few 1,000 foot lake freighters pass through the very narrow locks. We then walked about town and stopped in a few shops before grabbing lunch at the locally popular Karl’s restaurant and winery. I ordered a Panini and Kit enjoyed the specialty pizza. 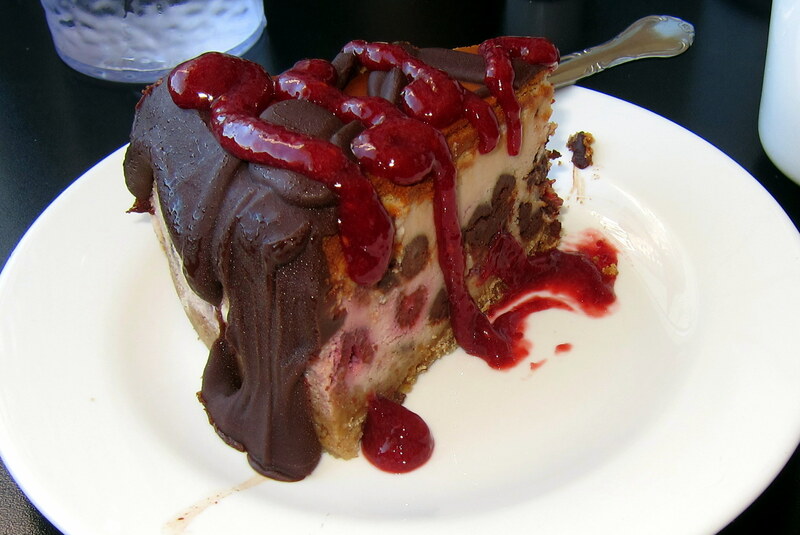 And for desert we shared a slice of chocolate chip cheesecake. We had to walk around the town some more to work off that incredible meal; Kit and I eventually made our way back to the trailer. As Kit read, I walked to the large grass field next to the campground to fly kites. As the sun set, we turned in for the evening listening to the periodic passing of the lake freighters outside our window. 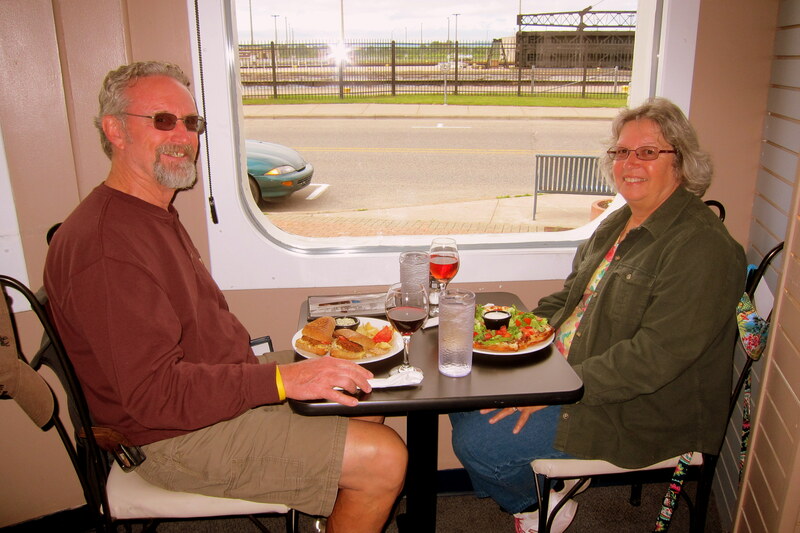 Friday, June 19, 2015: Leaving Sault Saint Marie, Michigan at 1020, Kit and I decided to head into Canada so we made our way across the Saint Mary’s river toward Sault Saint Marie, Ontario. 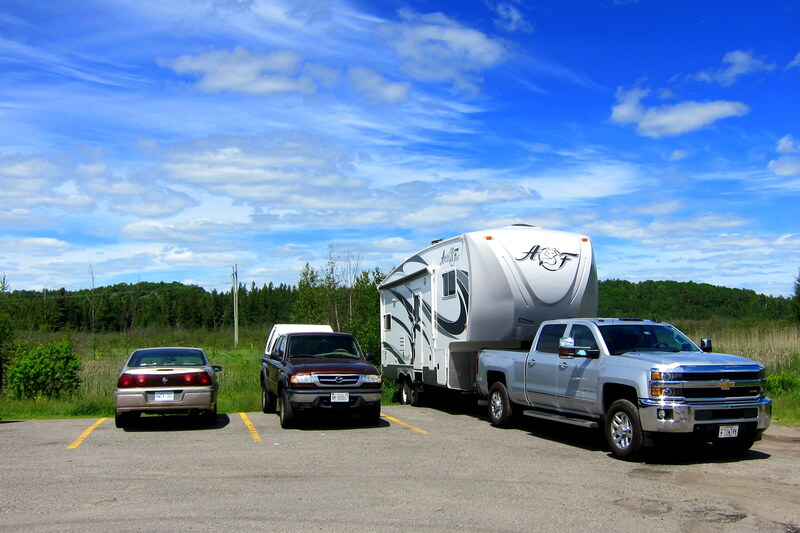 After clearing customs, we merged onto King’s Highway 17, also known as The Trans Canadian Highway, and pointed the rig east driving through the mostly rural area of Southern Ontario province. 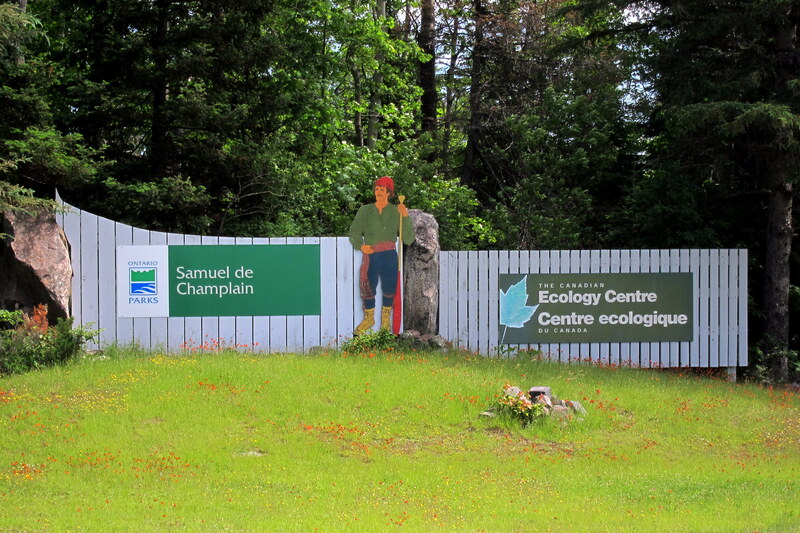 During today’s travel, we passed nearby the villages of Echo Bay, Pumpkin Point, Blind River, and Seldom Seen…..all of which had signs announcing their existence and all boosting populations of less than 600 folks. Each of these towns begged for exploration, but alas we must soldier on…..maybe next trip through! Nearing noontime, we came to a roadside Tim Horton’s and decided to stop for lunch and a break. Parking was tight, and being next-door to a gas station, vehicles were coming and going which made it rather difficult to maneuver into a suitable parking spot. 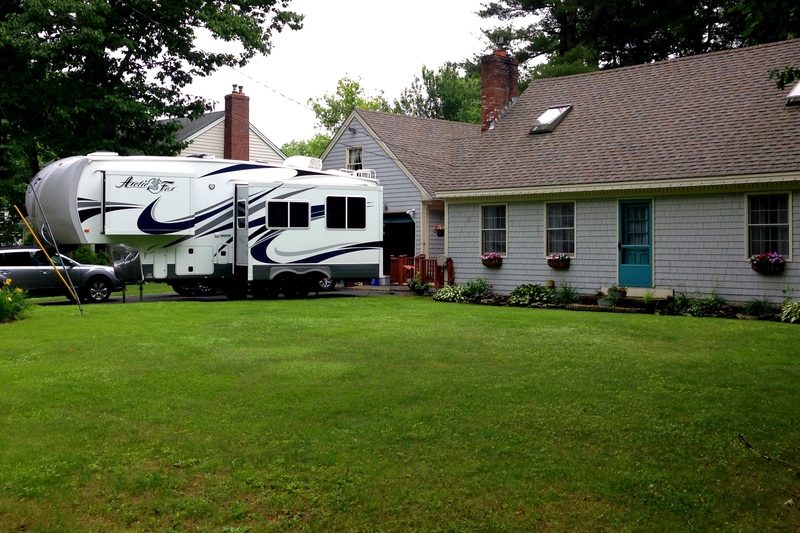 So I just did what any self-respecting RV’r would do, I backed into an end spot and let the camper hang out over the ditch…..problem solved! At 1830 hours, Kit located a promising looking camping opportunity so we exited the highway and made our way toward Champlain Provincial Park outside the town of Mattawa, Ontario. And set up the rig on a very nice, but somewhat tight camp spot for the evening. After a quick meal, we were done for the day so turned in fairly early, reading until we nodded off at around 2100. Saturday, June 20, 2015: Woke to a beautiful morning in southern Canada. Following a hearty breakfast, Kit and I decided to walk about and explore this interesting Provincial Park. 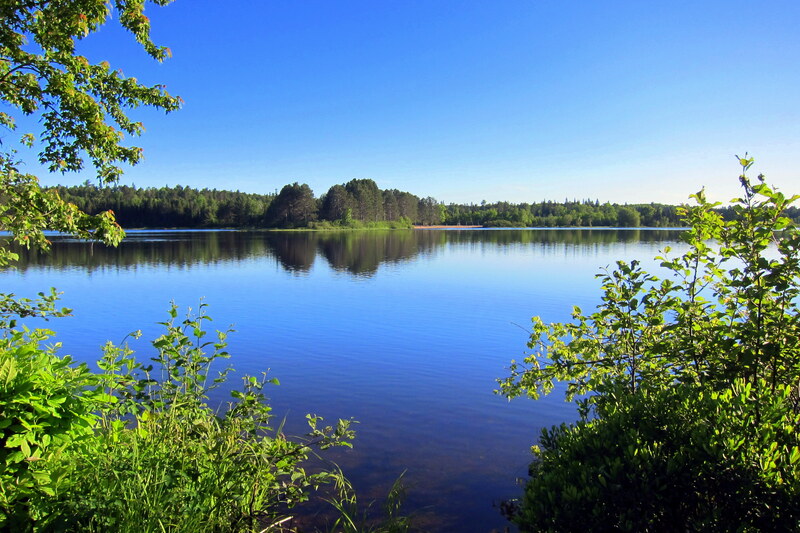 The campground is located on Moore Lake which is fed by The Champlain River. 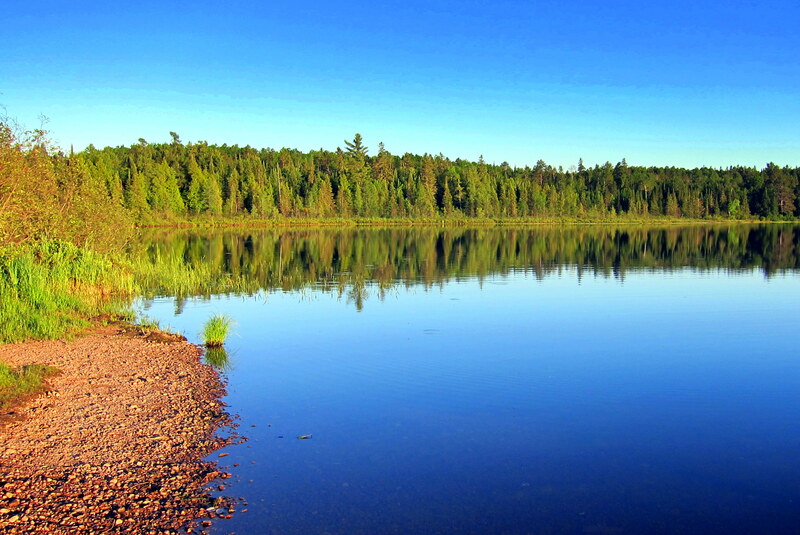 And features many trails that lead to secluded beaches for fishing or paddling. Returning to the camper, we departed at 1040 and slowly wound our way through the narrow roads with low hanging tree branches bouncing off the trailer. As we neared the main park road, a fellow camper motioned for us to stop and pointed to the roof of the trailer where a rather large tree branch was riding along. Concerned that I had once again dinged our roof, I quickly scaled the rear ladder and gingerly lifted the branch off the surface of the roof. The only damage was a bent TV antenna which will wait until our return home for repair. I should not be taking a rig of this size in many of the places I do, but then we would really miss some of the most beautiful places to camp! There are times I really miss our tent camping days…..Kit not so much! Back on the Trans Canadian Highway we eventually came upon Provincial Highway 416 SUD which we took toward the south and the US Border. 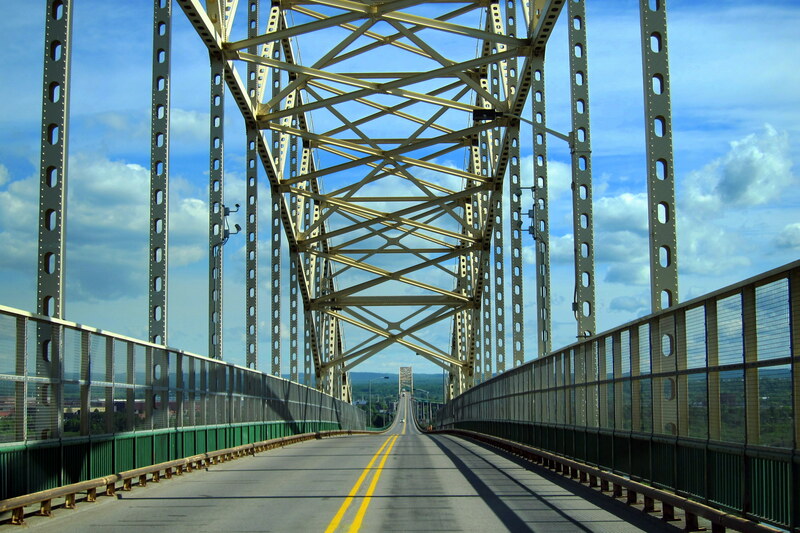 Crossing a bridge over The Saint Lawrence River at 1530 Kit and I drove toward the town of Ogdensburg, New York. At the border, the agent asked the customary questions and after some cheerful banter, waived us through. It seems the border patrol agents we have come into contact during this year trip are a lot more pleasant than in the past…..still professional and firm, but not as surly as they were just a few years ago. While stopping to fill our nearly depleted fuel tanks with inexpensive American diesel, we used the iPhone App All Stays to locate our next camping opportunity. Noticing there was a New York State Park a few miles to the east on highway NY-37 and being a normally busy Saturday, we called ahead to verify they had room for us. 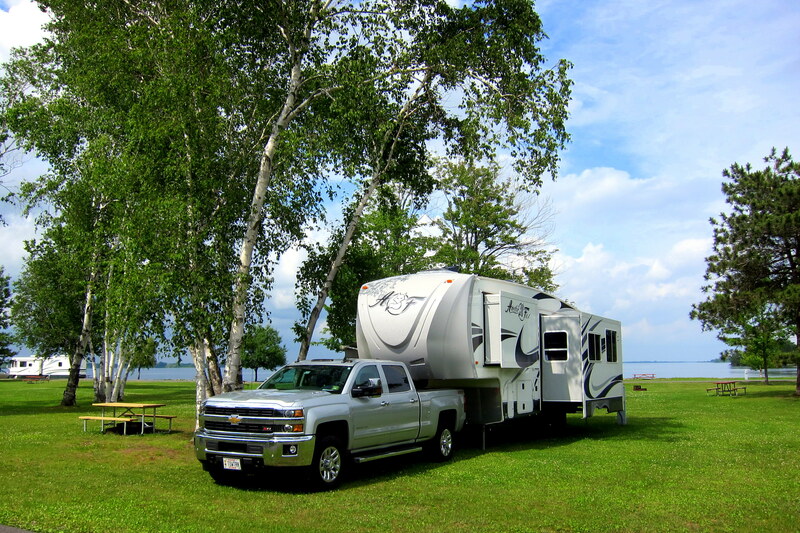 They did so we pulled into Coles Creek State Park and located a nice camp spot on the Saint Lawrence River. There were a number of weekenders in the park, but the place is so large and the individual campsites are roomy that it didn’t seem very crowded. 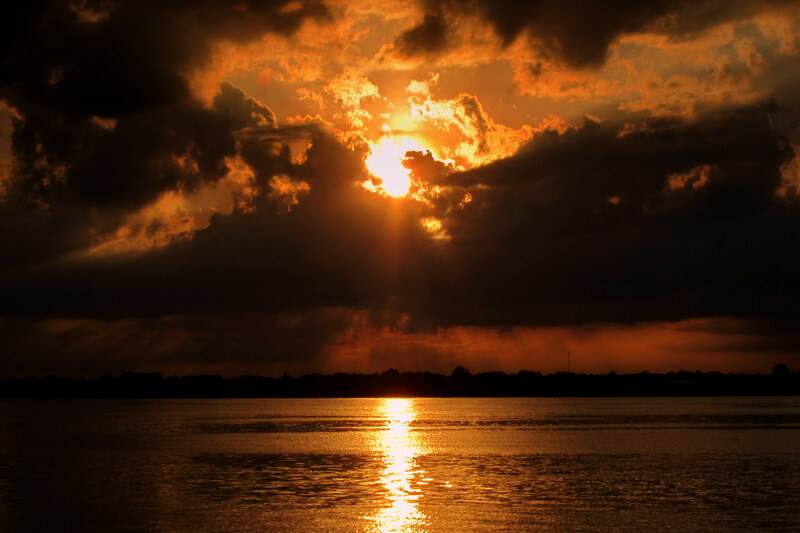 After a nice meal, we sipped an evening cocktail while watching the sun set over the stormy Saint Lawrence River with the shoreline of Morrisburg, Ontario in the distance. Sunday, June 22, 2015-Coles Creek State Park, New York: Woke to a brilliant sunshiny morning and Kit declared a down day for some rest and relaxation. We spent the day walking about the park, visiting with neighbors, reading and basically goofing off. 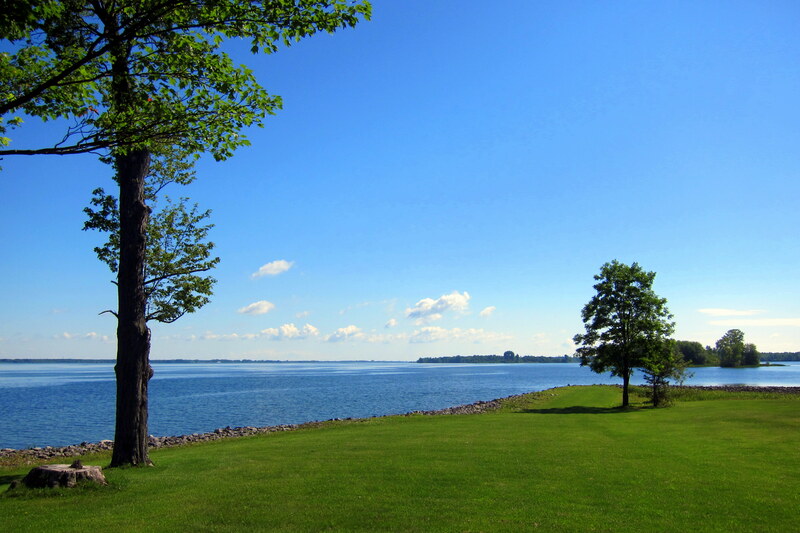 The 774 mile Saint Lawrence River connects the great Lakes with the Atlantic Ocean by way of the Saint Lawrence Seaway. This river highway provides ocean going freighters access to American and Canadian ports well inland. 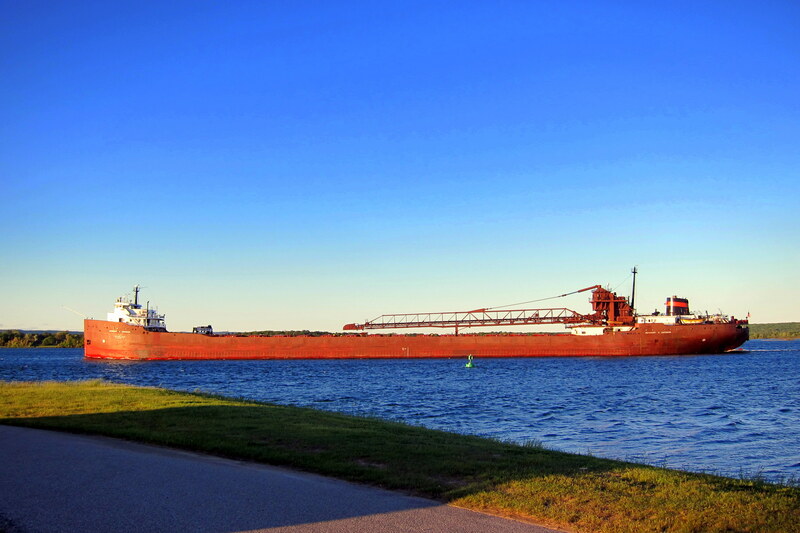 As busy as the Saint Mary’s River was up in Sault Saint Marie, there were just a half dozen or so freighters that passed by the campground during our stay, this may have been a result of being a weekend. After a very relaxing day, Kit and I prepared for tomorrows departure and turned in fairly early. 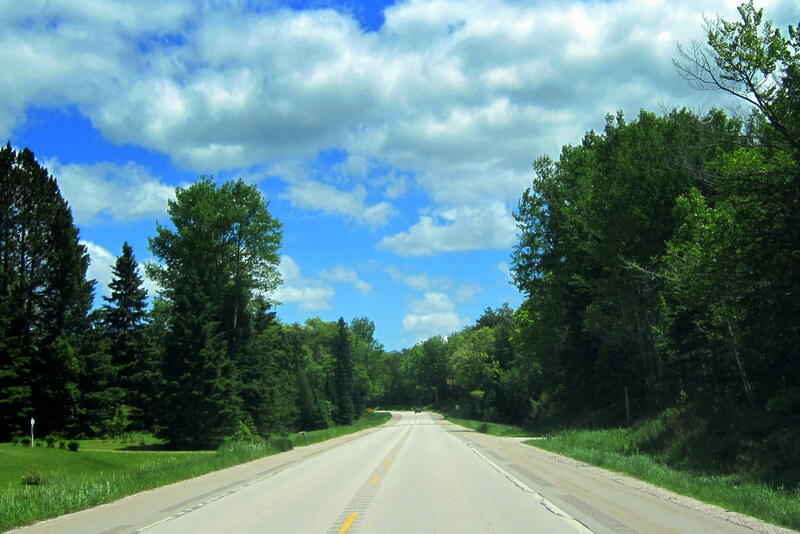 Monday, June 22, 2015: Leaving Coles Creek State Park at 1030 under bright blue skies with large puffy clouds. 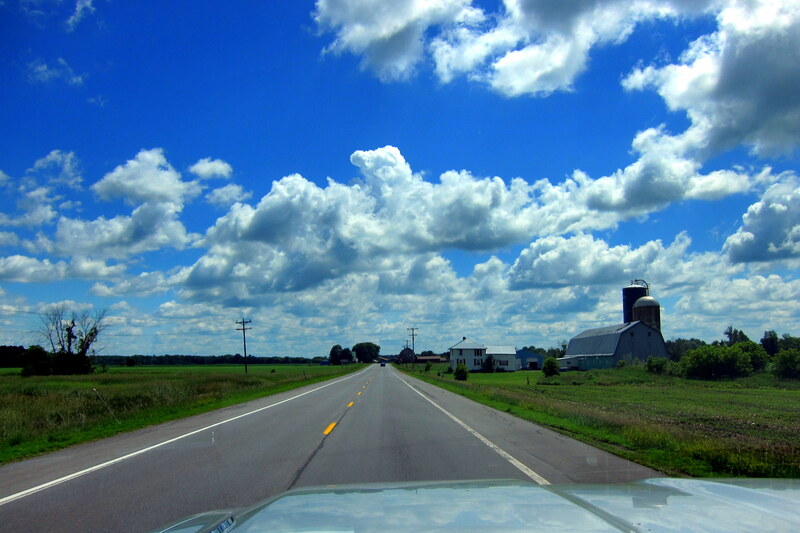 We hopped back on NY-37 and enjoyed the drive through a largely rural area of upstate New York. 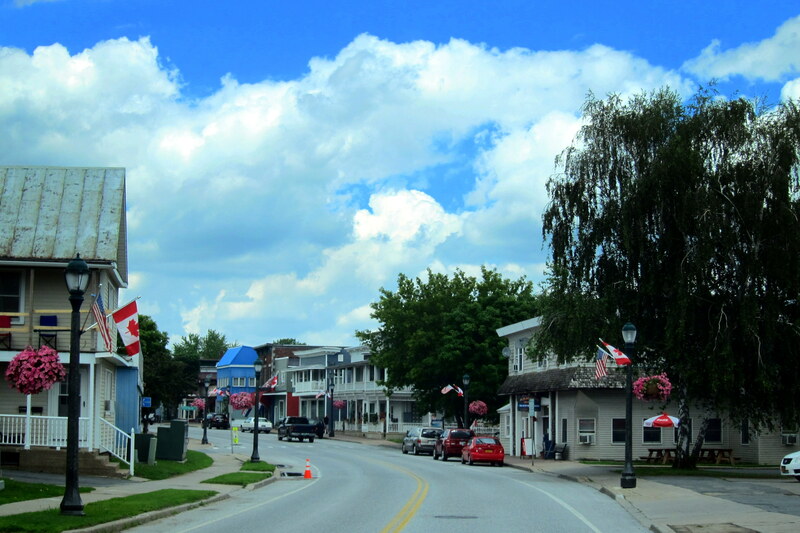 A few hours later, we merged onto US-11 which bisected a number of small towns as the highway led us easterly. Near the village of Chateaugay, I started noticing an unusual high number of local and state police patrol cars. It was then that Kit informed me we were a few miles north of the Clinton Correctional Facility and that the two convicts that had escaped were still on the loose. I fully expected to be pulled over so the officers could look in our camper, but they paid us no attention at all. We did, however ensure the trucks doors were locked! At 1245 we pulled into the quaint little town of Rouses Point, an area that we’ve explored in the past. 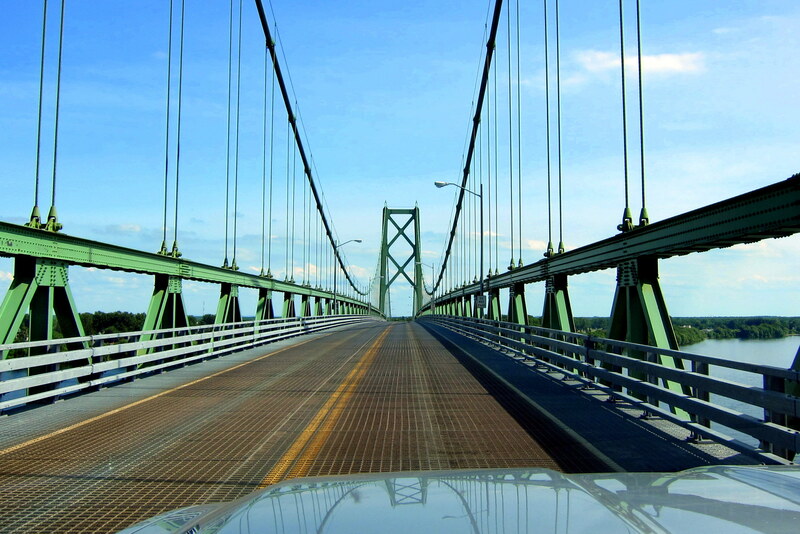 And ten minutes later we crossed the bridge over Lake Champlain and entered the state of Vermont. 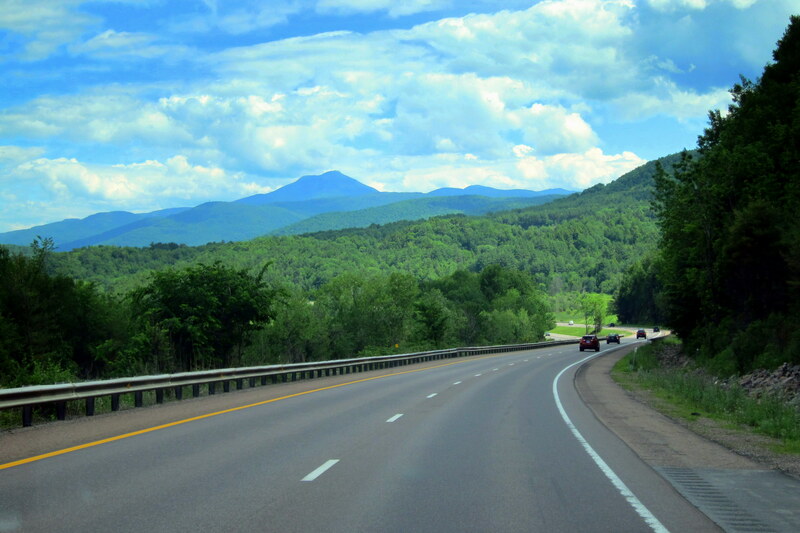 Kit and I wound our way through the countryside until we came to I-89 which took us south past the city of Burlington and on to our ultimate destination in central Vermont. Pulling into the only campground in the area, we set up on a nice site for a few days visit. Kit and I, as well as our children, used to live in this area of Vermont so have a number of friends that we want to try and see, so the rest of the day was spent sending “surprise, we’re in town” e-mails to folks to see if we could connect. 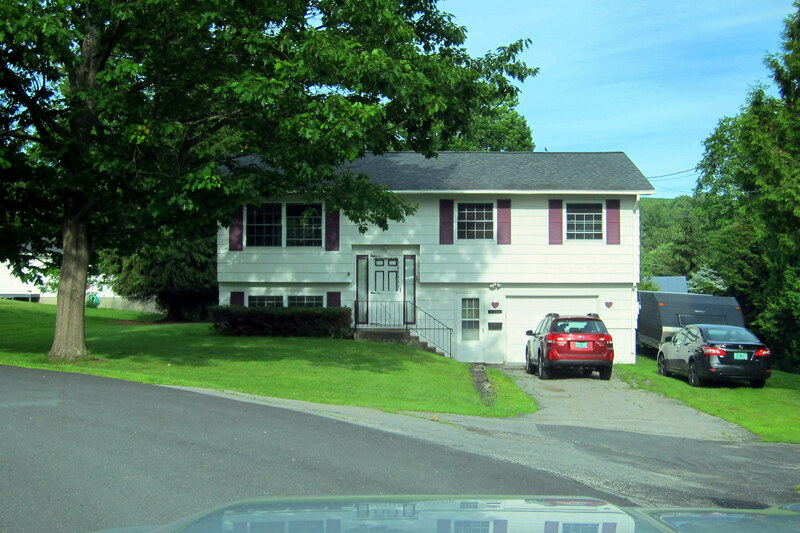 Tuesday, June 23 through Wednesday, June 24, 2014-Graniteville, Vermont: Late last night, we received a reply form one of the people Kit and I really wanted to see. Since he was available for breakfast, we met Monk at the regional hotspot of Soup and Greens in beautiful downtown Barre. 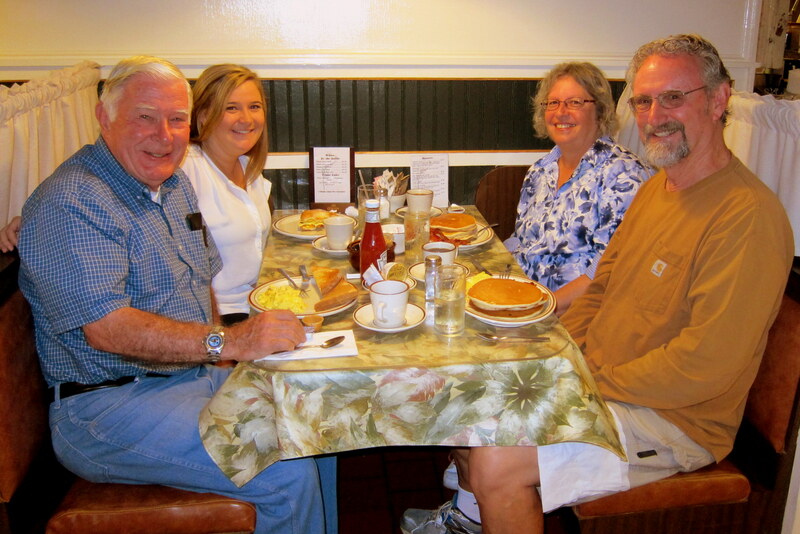 And we were delighted to see that his niece Lauren was in town and was able to join us! As you may remember, Monk had just lost his wife of 55 years just a few weeks earlier. 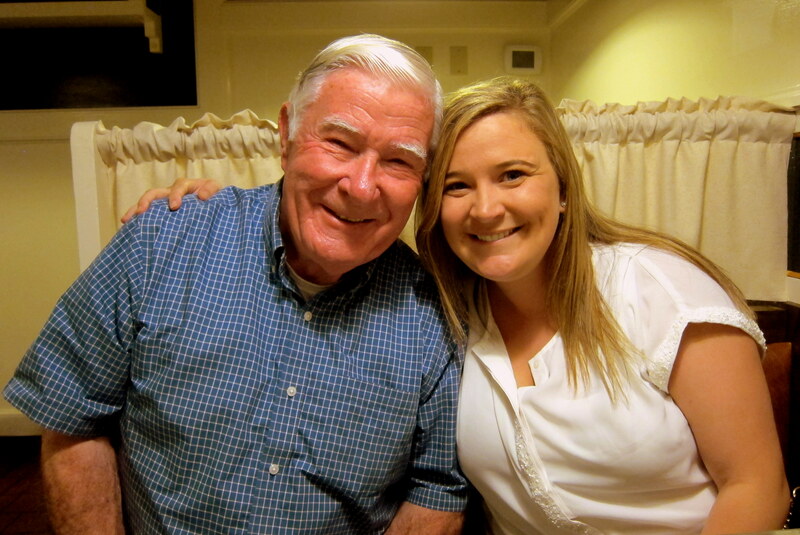 As our sons father-in-law, we truly wanted to deliver our personal condolences and spend time visiting with him. Lauren, an educator from Phoenix, Arizona and on summer break, had stayed on after the memorial service to help Monk out. 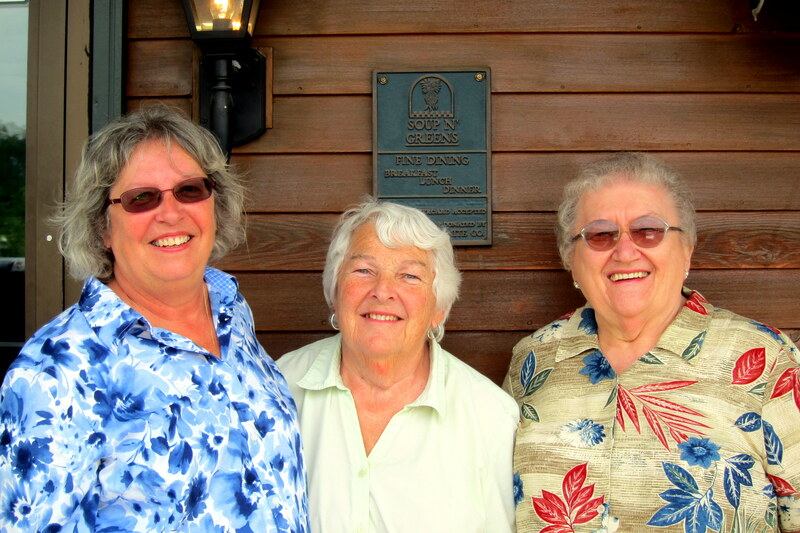 We had a great time visiting and reminiscing about Betty and hearing fascinating stories from their many years together. It so happens that Soup and Greens was their favorite local restaurant and they had breakfast there almost every morning after they retired. 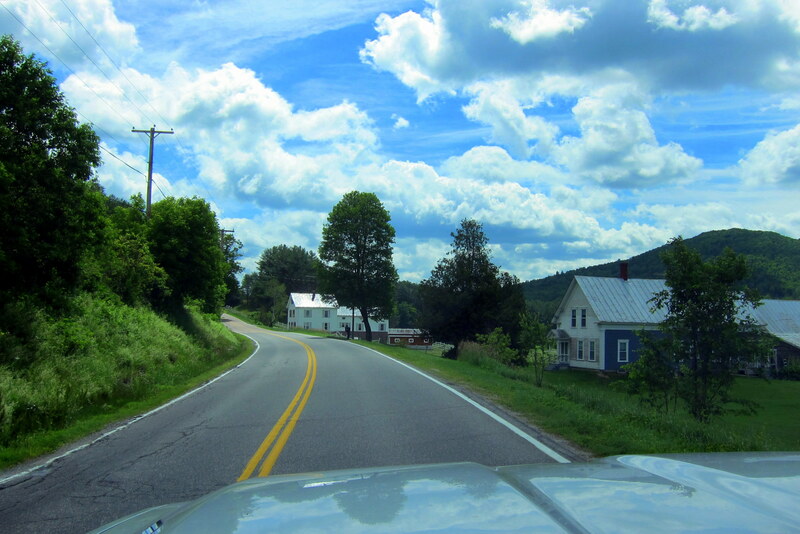 Later, Kit and I took the opportunity to drive through the beautiful Vermont countryside to the town of Randolph Center. 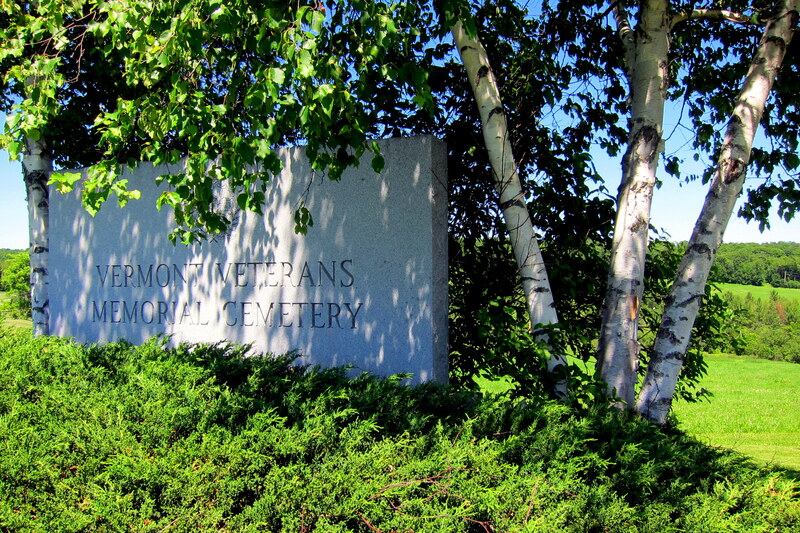 Where the Vermont Veterans Cemetery is located and paid our respects at Betty’s final resting place. 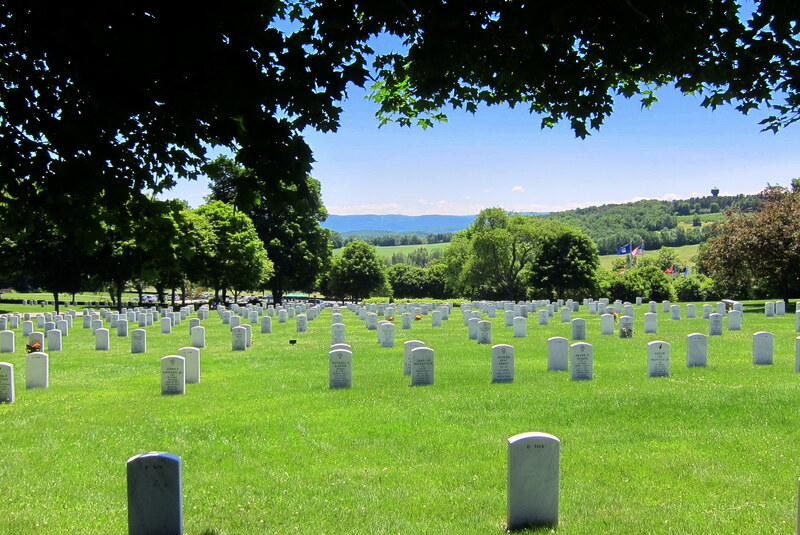 It is a peaceful and serene memorial park honoring Vermont’s veterans and their families. Kit and I spent a few hours there in quiet peaceful contemplation as the wind rustled the trees and the birds sang…..all cemeteries should be this nice! During our stay, Kit made arrangements to meet up with some old friends. Kit had worked as a computer programmer in nearby Montpelier, and she was delighted to reconnect with two of her former workmates for a nice lunch. Jan and Betty are retired as well, and have remained in the area…..yep, that’s the same Soup and Greens where we met Monk for breakfast! 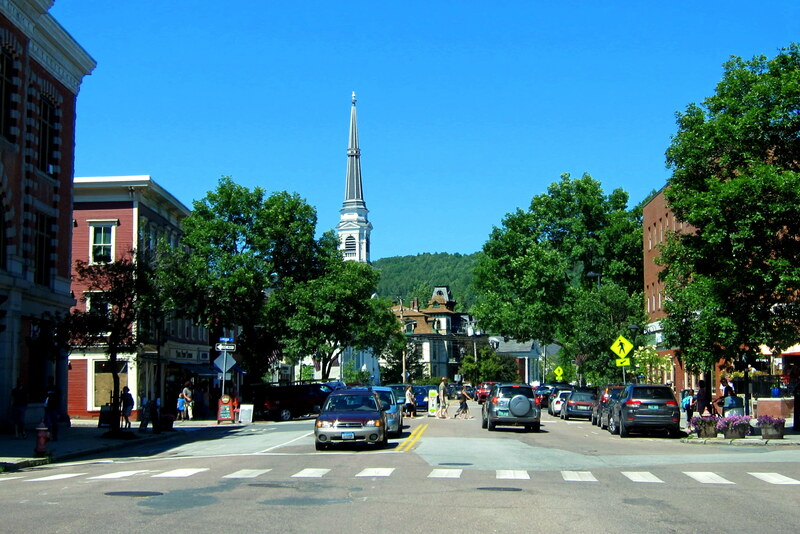 Barre is a small town! 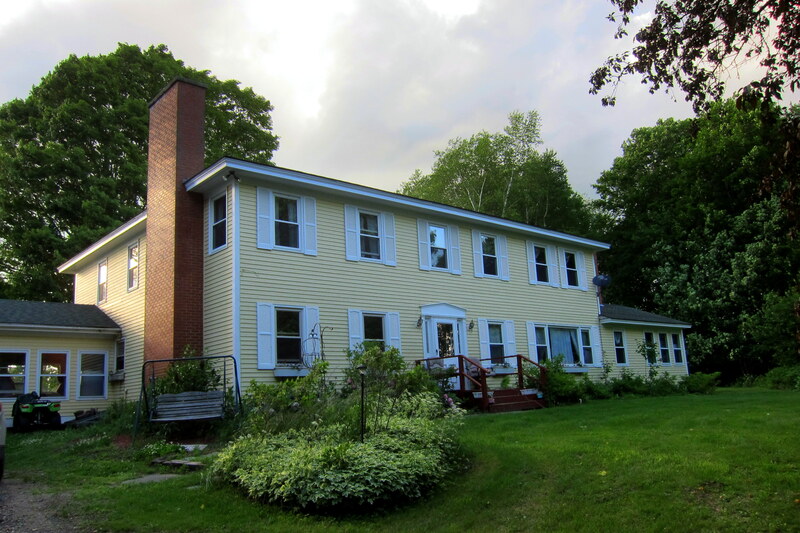 Some other folks we wanted to visit with were Bob and Fay who are making a home for their granddaughters up in Lyndonville, Vermont. Even though Fay is successfully recovering from some health issues, they graciously invited us up for an afternoon. 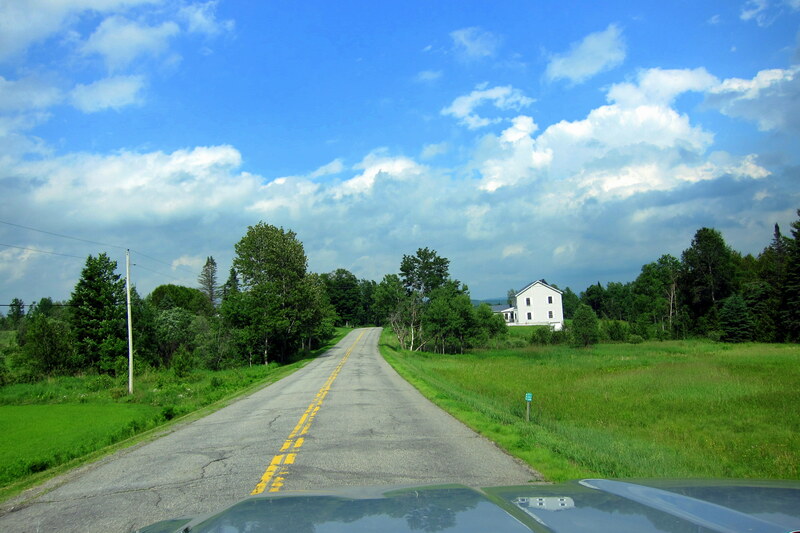 Whenever we travel Kit and I like to take the back roads…..true, it usually takes longer and some of the roads can be rough, or in Vermont’s case made from dirt and gravel, they are generally so much more scenic! In addition, one stumbles across some of the most interesting items, such as this nautical display. Over 600 feet above sea level and 150 miles from the nearest ocean, this family is indeed ready for any effects of global warming! 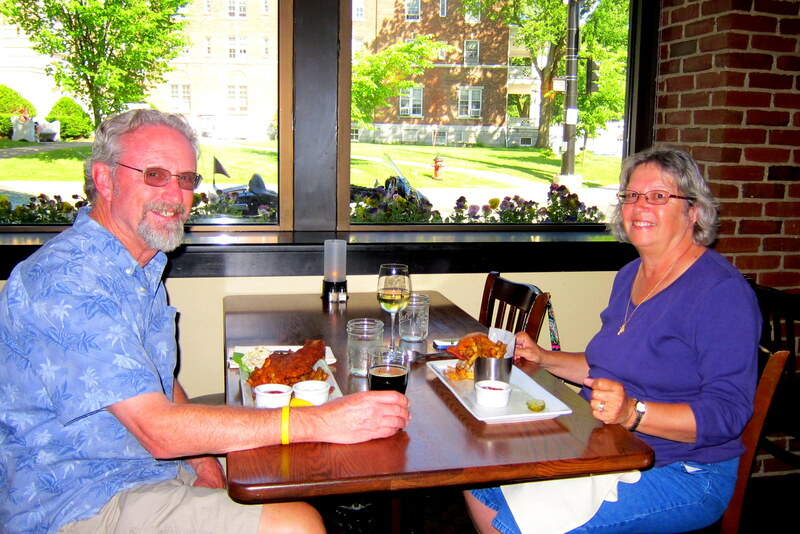 Bob and Fay are originally from northern Maine but have called Vermont their home for the past thirty plus years. 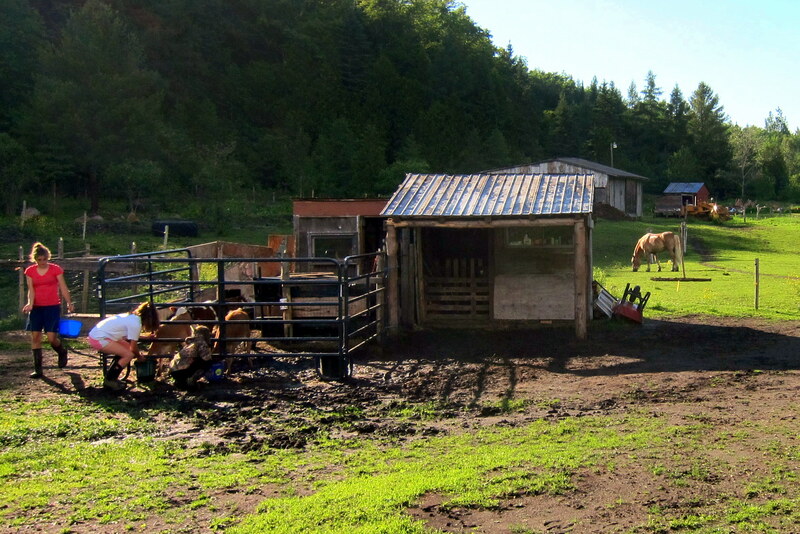 They live on a 100 acre farm in the Northeast kingdom region of the state and have a lovely home. Their granddaughters are actively involved in the local 4H club raising, caring for and showing in competition these rather large fellows. 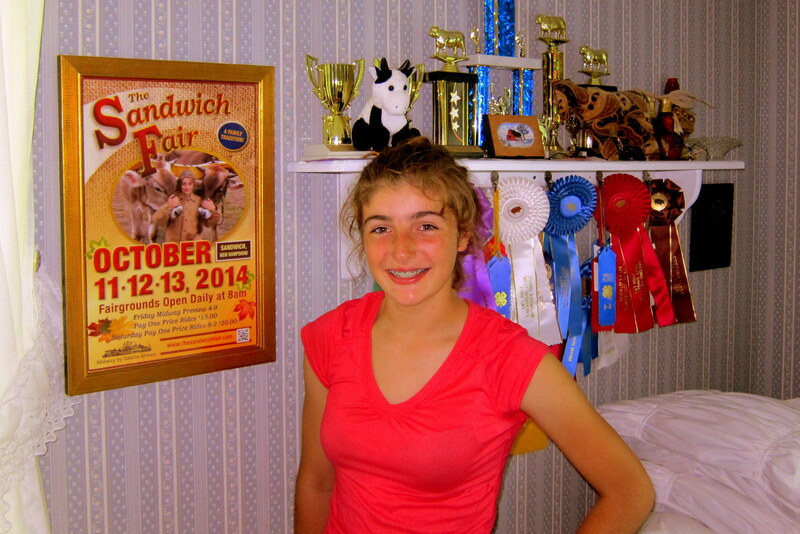 Katie, the eldest has won numerous trophies and ribbons at agricultural fairs about the country, and has even been honored by appearing in a promotion for last year’s fair down in Sandwich, NH. Her younger sister Kameron is a champion snowmobile racer and has begun raising her own oxen…..here she introduces her charge to the more mature animals. 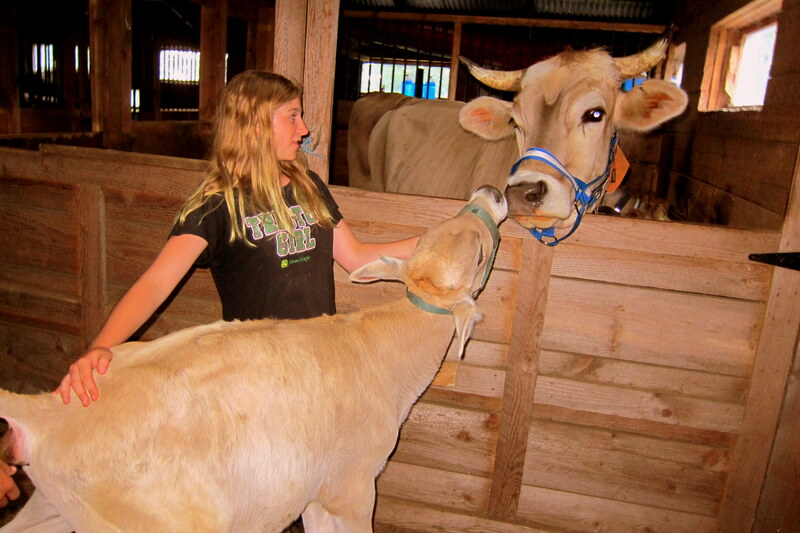 As one would expect, the girls have daily chores, which they accomplish like old farm hands. They are both intelligent and delightful young ladies! Bob and Fay have a lot to be proud of! Following a very nice visit, and an outstanding country style meal, Kit and I made our way back to the campground for the evening. On one morning we took the opportunity to play tourist in the region we lived in some thirty years ago. 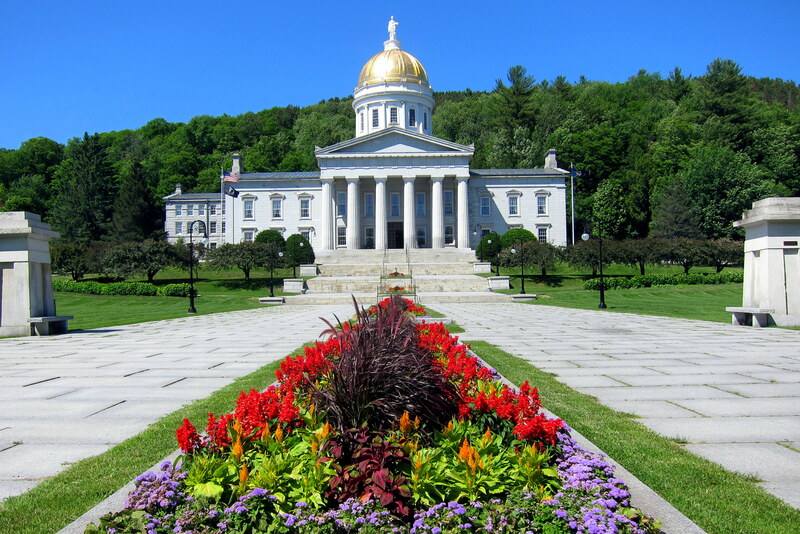 One of the stops was the state capital of Montpelier…..which in our opinion is the most attractive capital city in the nation. And features an incredibly beautiful state capital building. With a statewide population of a little over a half million folks, Vermont has been successful in maintaining its rural charm. Over 75 percent of the state is covered in trees and many of those are hardwoods that attract thousands of tourists during foliage season. 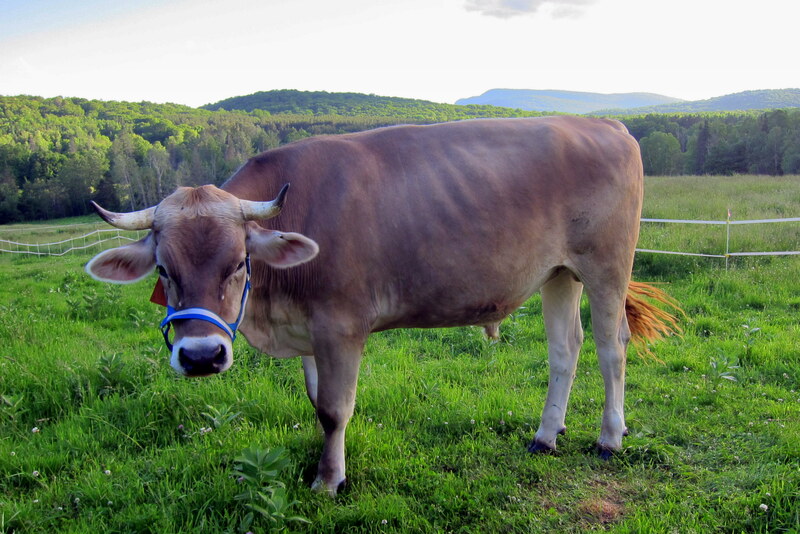 Mainly an agricultural state, Vermont produces many dairy products and its famous Maple Syrup. Kit and I loved the five years we lived in Vermont and might have stayed had the job prospects for a military retiree been a little better. 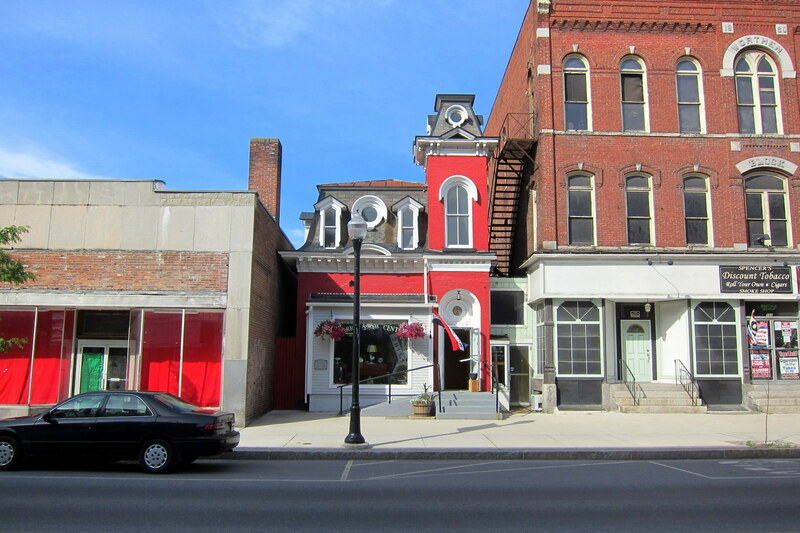 We also spent a few hours walking about our former town of Barre. 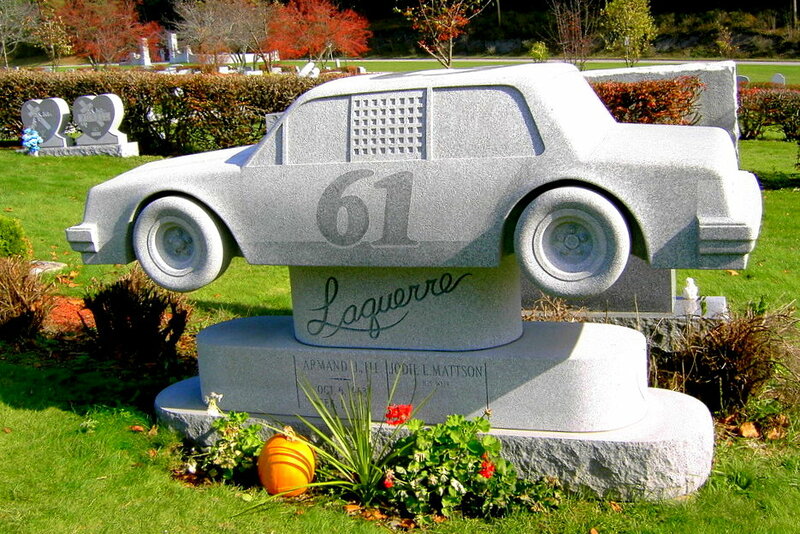 With the nearby Rock of Ages granite quarry and the numerous “stone sheds” in town, coupled with the many Italian artisans that shaped the granite, this blue collar town produces some of the finest Memorial Markers in the world! The local cemetery is full of the artistic expression that these stone cutters used to create memorials for their own families, such as this marker for a young race car driver tragically killed last year. This young man was a fourth generation race car driver…..I used to enjoy watching his grandfather compete on the quarter mile high banks of Barre’s Thunder Road International Speedbowl which was just a short distance from our home. What a poignant and lasting memory for a member of an iconic racing family and another example of the fragility of life! The town of Barre is a mix of old and new, having undergone a gentrification of sorts since we lived here. 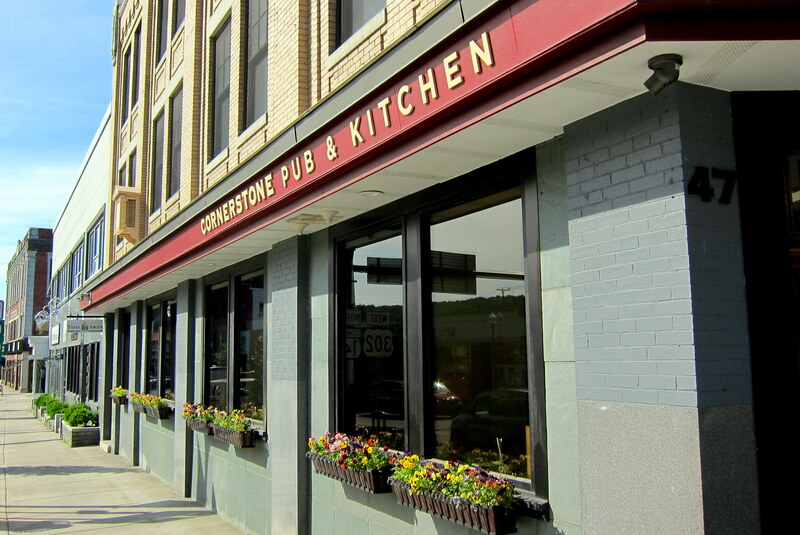 Many old buildings have been repurposed such as the former Granite Savings Bank that is now the Cornerstone Pub. Where Kit and I enjoyed a nice late day meal and some local brews. ….and discovered, except for the larger trees, the place hadn’t changed much at all! A great stay in a great area of the US, but tomorrow is another great day as it should be the final push toward home! Thursday, June 25, 2015: At around 1045, Kit and I rolled out of the Lazy Lions RV Park and made our way to highway US-302. The weather is perfect for traveling with partly cloudy skies and temperatures in the mid 70’s. 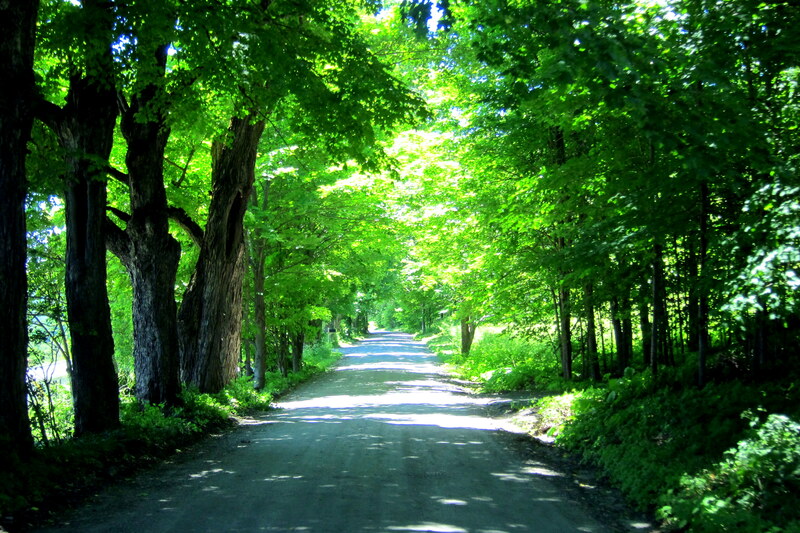 We are very familiar with this route as we have driven it many times over the years. Absent of any east west interstate, US-302 is the main artery across the three upper New England states. 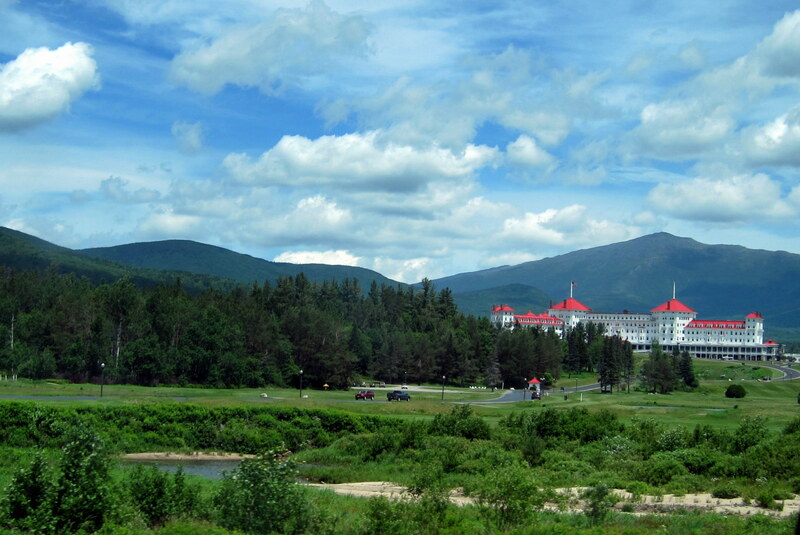 Leaving the hills of Vermont, the highway bisects the White Mountains of New Hampshire passing the famous Mount Washington Hotel. Entering our home state of Maine, the highway continues east past our camp on Sebago Lake and finally terminates in the seaside town of Portland. From here it is a short hop on I-95 to our home in Brunswick and at 1845, we backed into our driveway. It has been a great trip but Kit and I are glad to be home. Now, we play catch up and try to get everything ready for the relatively short summer season made even shorter by our extended trip. Thanks to all for the very nice comments left on our website…..we enjoyed having everyone along for the adventure, so until next year…..bye! 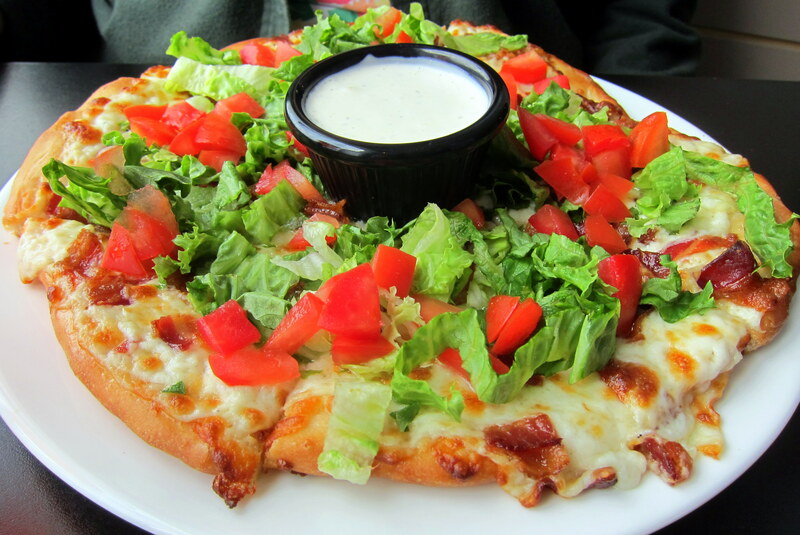 One other thing; Soup and Greens was established when we lived in VT in the early 80’s. There was speculation it wouldn’t last, serving only soup and salads. Fortunately, it has morphed into the local family diner serving quite a variety of “comfort food”! A GREAT place to meet up with family and friends, it’s now fondly called “Soups”. Cumulative total of the states we have visited. 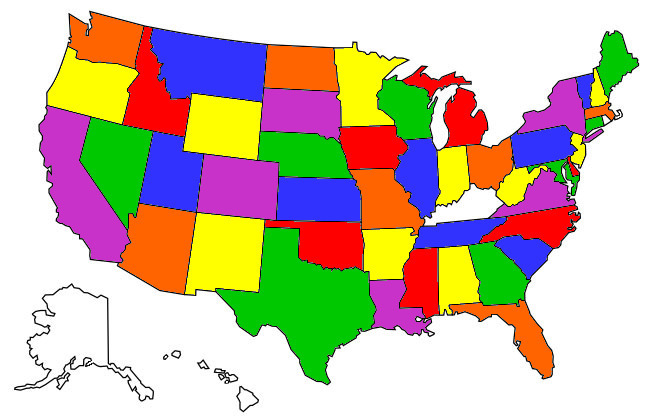 Yep, one missing within the contiguous US…..did you guess Kentucky? Thanks for taking me along. Looking forward to your next adventure. I know you’ve been home but welcome home anyway! I am looking forward to seeing you guys…maybe in a square? Glad you’re home! Couldn’t help noticing how mush Lauren and Katie look alike! Tell me again, when do Suzie and company arrive? Are they here? Oh, by the way….I did guess Kentucky…..
Did you notice how vibrant the colors are as you traveled east through northern tier of states? They remind me of the Scandinavia countries I visited a long time ago. All of these regions have short growing seasons, and long, cold winters. Enjoyed all your Blogs, but hope you will be home a bit longer this time before heading out again! Thanks for the last ride-along, Bill and Kit! Next year truly plan to spend some time in Kentucky! True story, my San Francisco-raised girlfriend was driving through the emerald green hills of Kentucky on vacation with her husband, the dentist. She remarked to her husband, “Geez, Kentucky is just gorgeous! I (emphasis on “I”) could live here!” As she tells it, her husband (who grew up in Ohio and Kentucky) snapped his head around and said, “REALLY?” She said, “Sure, really.” Well, before she could change her mind, in a NY minute, he sold his dental practice in San Francisco, bought a dental practice in Lexington, and placed an order with a moving company to get them moved to Lexington! Kentucky gets a lot of rain in the summertime, hence the lush, green hills. Welcome home and I hope you are having a great time with the Las Vegas contingent at the lake! Great trip and journal–thank you for letting us ride along. We look forward to hearing more of your adventures once you’re “settled”, which is probably just when you’re about to leave again!